Size – Let me expand a little; when you’re packing your backpack before leaving you try to fit as much in as possible. If you have a 80 litre (backpacks are measures in litre capacity) you will fill it to the top and most likely you won’t need all the stuff. We managed to have clothes for around 8/10 days before doing a wash. Don’t pack 14 pairs of socks and pants, pack less and wash them more often. In most places washing is cheap. If not, wash your pants and socks at night in the hostel. Washing powder is very cheap to buy! Also, remember you’ll want to have a little bit of space in the backpack for some souvenirs. If you plan on buying T-shirts or clothes, then throw away old ones as you get new ones (see the clothes section further down about this). If you’re planning on doing some long-term travel, a backpack around 60 litres should be a decent size so that it enables you to fit a med kit, small sleeping sack, spare pair of trainers, flip flops, clothes, book, electronics etc. Brand – Your bag will get battered about. In Fiji it will be thrown from one boat to another; in Thailand it will be shoved into a small space in the back of a van; in Bolivia i will be covered in dust on top of buckets of fish coming from Lake Titicaca. You need something sturdy. Rain / travel protectors are good. If you are traveling in rainy season in Asia then it’s a must. Don’t go for supermarket own brands, get something recognised such as The North Face, Life Venture, Osprey, Vango etc. But best of all get your hands on it, fill the bag with about 15kg and grab the bag by the handle only and see how sturdy it feels, test the zips, etc. Travel backpack – The major difference between a travel backpack and a hiking backpack is the entry. A travel backpack will have a zip with holes for a lock that opens the entire backpack up. Hiking backpacks only open from the top with a toggle and may have a separate compartment at the bottom for shoes. They are often known as a back loader or a top loader. With a top loader, if you need an item at the bottom of the bag, it’s a bit of an effort to get to it as you have to take everything above it out. With a back loader, the entire compartment opens which means easier access to everything. Whatever the choice you make I would suggest getting to a shop and trying some packs on first. Load them up with some gear so you get a feel of the weight. Around 12-15 kg is your average backpack weight. Day bag – You’re not going to be lugging your big backpack around all the time. For tours or 2/3 day walking trips, you’re best using a small backpack. It’s also best to keep valuables in the day bag, especially when you’re on the bus. Your big backpack is kept in the hold so you need to keep your valuables with you. Most travel backpacks come with a small day pack that often attaches to the big bag. This is what we had, one had a 20 litre day bag and the other a 15 litre. Great for carrying a camera, book, map, rain mac etc. John had the Altai 65 Travel Rucksack which was really great. It came with a small day sack that could be folded up into a small packet which could fit in your pocket. Overall it was great – no problems and no breakages. After one year it didn’t look too beaten up considering what it had been through. We bought it from Go Outdoors as they had an in store price promise to beat any online price. It also gave us a chance to see the bag close up. You can get it online from Simply Hike for £152.95 which to be honest is very expensive. The version for sale currently is the new style, if you can get your hands on the old style or the new one for cheaper you won’t be disappointed. 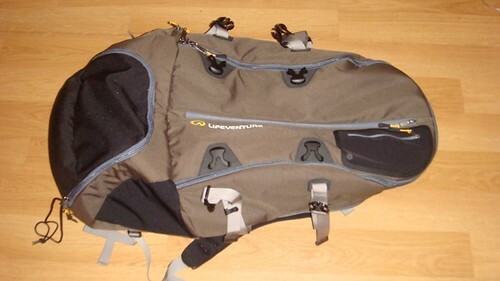 He did take another backpack, a Berghaus Octans 40 Rucksack, which is actually a climbing rucksack. It was great for trekking and could fit two people’s clothes for a 3 day trip. It was used for the Inca Trail and other multi day trekking activities. Best of all it folded down really small (no fixed frame) and fitted into his smaller day sack. You can get one for around £60 from amazon. I had the Lowe Alpine World Tour ND 60 + 20. A similar bag but the daypack was a little more sturdy and could zip to the back of the main bag. The day sack was ace with a few hidden pockets which were great for the passports and iPod. The bag was good and was specially designed for someone of a smaller frame. I had my settings to XS (the smallest it could go). At 5ft 3, it wasn’t a brilliant fit but it was comfortable enough. Backpacks are not really made for small people, at one point we started to try on kids backpacks! If you’re still having trouble finding a backpack which fits properly, take a look at some women-specific backpacks. I managed a great deal with my backpack, also from Go Outdoors. We bought it for around £100, however, we then received a leaflet saying an upcoming sale would have the bag at only £45. So we took the bag back, got a refund after buying it for the full price and then bought it again when the sale was on saving half the price. BARGAIN!!! You can buy the new version of the bag from Gear Zone for a very reasonable £115.